The Welsh Corgi, Cardigan was bred in wales,they are quite same as the Pembroke Welsh Corgi both of these breeds are from same group but the Welsh Corgi is the older from the other. This breed of dogs was used for guarding and as a watchdog, they have some instincts of hunting and can be used as a hunter. 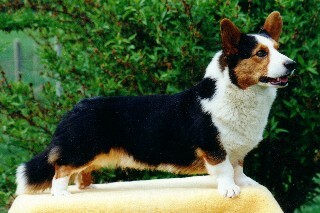 The Welsh corgi is a small but a tough breed; they have a Fox-Like face and have long and low build. This breed of dogs are very intelligent and loyal, they possess lots of strength and speed. This dog breed has a very sweet and nice personality, they are very intelligent, sensible and alert. They are suspicious with strangers and have tendency to alert their family by bark. They built a strong bonding with their master and can become destructive if they are left alone for some period of time. They do well with children and older people and are very good house dogs. This breed of dog has a double coat: the outer coat is harsh, straight and resistant where as the undercoat is dense and soft in texture. The coat comes in a variety of colors such as sable, red, brindle, black, blue merle, black and tan, and black and brindle. The coat also has white markings. The Cardigan is a constant shedder with heavy bi-annual shedding. This breed of dog is a good learner and can learn quickly, they require early socialization and obedience training, and they will not respond to any hard and harsh methods of training, the training should be given with fairness and patience. The Welsh Corgi required regular exercise to remain fit, they love to go for walks and enjoy family play sessions. They are more active indoor as compare to outdoor, this dog breed does well in apartments if they are provided sufficient exercise. This particular breed of dogs needs minimal grooming. They should be brushed regularly with a firm bristle brush; bathing should be done, when mandatory, with a mild shampoo. The Cardigan Welsh Corgi is prone to such health problems as progressive retinal atrophy, glaucoma, cataracts, back problems, its important to check the health of your pet, if there is any sign of such health problems, consult with a veterinary at the earliest to diagnose the disease and start treatment.